The typical, Quality 18 gauge Steel, Kettle Hat Helmet is shaped like a traditional hat. 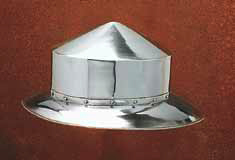 A conical top on a cylindrical body, while the steel brim extends out just slightly, with a 22 to 23 Inch Circumference. This is probably the best piece for a 13th or 14th Byzantine impression, as this style of hat was rather exclusive to Eastern and Anatolian nations. This page was last modified on 26 October 2013, at 18:56.